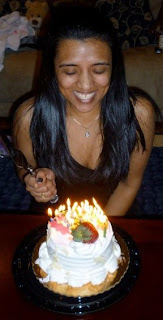 First off, I owe my best friend, Sheela, a massive shout out for motivating me to write this post! This was probably the most memorable 2011 moment for me! Why such a peculiar reaction, you might ask? Because I always swore I’d NEVER cut or color my hair, mainly because I was too paranoid that my hair would get damaged and never grow back. I’ve sort of had a love affair with my long, black hair! Hehe. Why, then, did I finally change my hair so drastically? Well, this year, I went through something in my personal life that shook me and took a drastic toll on me. So, when I went for a much-needed haircut, I sat in the chair and said to my stylist – “Chop it all off and color it!”. She looked at me like I had 7 heads and said – “Um, are you sure?”. She’s well aware of my love affair with my hair. I said – “Yes, just do it before I change my mind!” And so she did. The seed for this had originally been planted in my head by Sheela but even she didn’t think I’d really do it! When I walked out of that salon, I felt like a new person. This was the farthest step I had ever taken out of my comfort zone and it felt amazing! Over the summer, I had lost myself in a very dark place but, as I looked at the new me in the mirror, I felt like I had met myself again. So, while it’s just a new hair cut and color, it symbolizes so much more than just that. It stands for a very significant moment in my life. It stands for the strength I hold within me and the strength I derive from my amazing family and friends. Also, when I got back to the US, I was on the brim of a new and very exciting part of my life – going to grad school! I was starting classes in a week and I just wanted to “shed” all the negative energy from what I had gone through and get a fresh start! It marked a point in my life where I changed so much and yet remained true to myself. And after that haircut, I’ve taken so many more risks, including finally starting this blog, which has been one of the best things I’ve ever done! I feel like making that change in my hairstyle gave me the comfort and courage to make so many other changes and gave me a new confidence! This post is, by far, the closest to my heart. Hope you guys enjoyed it. Thank you SO very much for all your support with this blog! Wishing you all A VERY HAPPY NEW YEAR! Previous Post Hello all ….